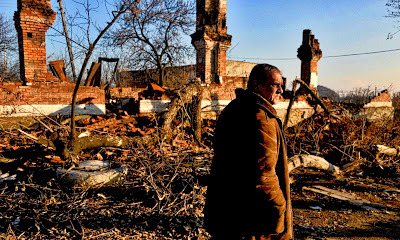 KOMMUNAR, Ukraine -- Life in Kommunar was never easy; the last thing the depressed mining settlement needed was a war. 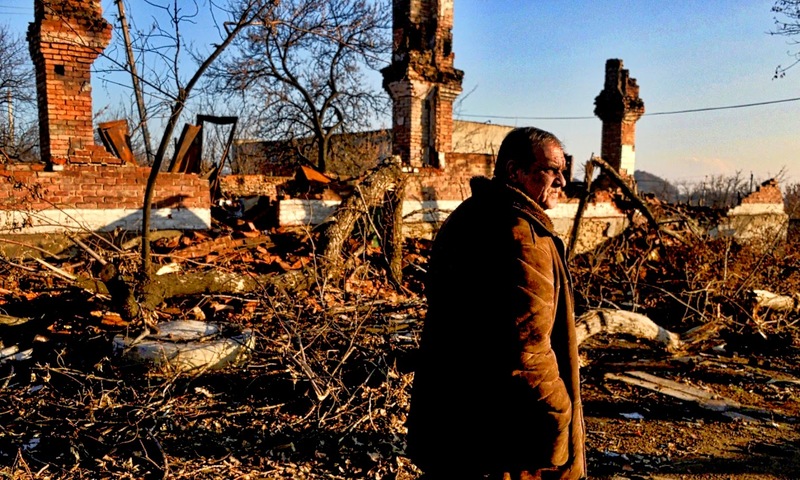 A man walks past damaged buildings in Kommunar. The conflict that ripped through the Kommunar in recent months, as elsewhere in eastern Ukraine, has added to existing social woes to create both a short-term humanitarian disaster and a longer-term problem of how Ukraine can reintegrate the territory after the pain and suffering of war. With little money, little food and few medicines, people in the town are eking out a miserable existence, and most blame Kiev for their predicament. As Angela Merkel and François Hollande shuttle from Kiev to Moscow in an attempt to end the fighting, the situation on the ground shows just how difficult it will be to find a lasting solution here: who will fund the regeneration of long-neglected areas, and how will the anger and hatred prompted by the conflict be dampened? While there is little doubt that without arms, finance and television propaganda from Russia this would never have become a “shooting war”, as the conflict has continued the situation across the Donbass has become gradually, but palpably, “Bosnified”. A video that surfaced in the aftermath of the battle for Donetsk airport last month showed “Givi”, one of the rebel commanders, throwing Ukrainian prisoners into the mud, hitting them in the face, and brandishing a knife at them. He later sliced off the insignia from their arms and forced them to eat the patches. On the Ukrainian side, attitudes towards all those who were unwilling or unable to leave their homes in the zone controlled by the rebels has hardened, with a new permit system for crossing the lines, and an increasing belief that life should be made as difficult as possible for those remaining in rebel territory. In Kiev, Ihor Lapin, a fighter with the Aidar volunteer battalion and now an MP in Ukraine’s parliament, said negotiations are useless, and the only way to help reintegrate the region is to make life miserable for those remaining, even insinuating that enforced famine (a war crime) would somehow turn people against the separatist authorities. In Kommunar, the miserable humanitarian situation seems only likely to play into the hands of the rebels, for now at least. Like most of the towns in the region, it is a decaying monument to Soviet industrial planning, a settlement of around 2,500 people servicing a coal mine. Nobody has de-iced the streets all winter, making its roads and pavements one great skating rink, the elderly residents shuffling gingerly along at snail’s pace. Shops are boarded up and the houses were falling down even before they suffered from the rockets and mortars fired during the conflict. While a few people became hugely rich from the proceeds of east Ukraine’s coal and mineral wealth, nobody thought to fund even the most basic municipal improvements here. No homes have landline telephones and there is no gas pipeline to the town. The main source of work was the local mine, where long shifts of backbreaking, dangerous work were rewarded with meagre wages. Military action only compounded all these problems. Ukrainian forces were based in the town for a month in August and September last year, before a massive rebel offensive backed with Russian armour and troops forced Kiev’s forces to retreat and the two sides signed a ceasefire agreement in Minsk. The town went for long periods without water or electricity, and most people slept in basements to avoid the shelling. The coal mine had to be abandoned, and when workers returned a month later, they found much of it had become flooded, destroying about £4 million ($6 million) of equipment. The miners are back working gruelling shifts, but have no idea when they will be paid. In late January, they were paid for the first two weeks of November. As that ceasefire has fully collapsed in recent weeks, the sounds of artillery fire are again audible on a daily basis in the town. So far it has been spared fighting, but the death toll in east Ukraine rises daily as Russia continues to support the rebels, both sides continue to use imprecise weaponry and civilians get caught in the crossfire. Valentina, 52, is one of several volunteers from Kommunar helping to distribute what little humanitarian aid reaches the town. She and a number of other hardy local women travel back and forward to Donetsk, buying medicines with any funds they can scrape together as there is no working pharmacy near the town. One day last week, Valentina did the rounds of a few houses, giving what tablets she had managed to find in Donetsk to those who needed them. At each stop, there were anxious faces and tears. Vera Martynovskaya has lived alone for 30 years, since her husband died. The 90-year-old was too frail to move to a cellar last summer, and so stayed in her apartment during the conflict. The explosions destroyed what was left of her hearing. “I feel like I have aeroplanes in my head,” she said, swaddled in a purple shawl to keep out the chilly air of the apartment, in response to a written question about how she was feeling. “When we came the first time we found her trying to cook two slices of rotting apple in a saucepan,” said Valentina. Further down the road, residents recalled the demise of Valya, 55, whose husband and brother both died within a short space of time early last year. She was admitted into a psychiatric unit, but released a few months later when the war started. Like other residents, she spent much of last summer hiding in the basement of her cottage, as Ukrainian and rebel forces exchanged fire at ground level. After the military action was over, Valya complained to her neighbours about how tough life was. “She would say ‘There’s nothing to eat, there’s nothing to do, there’s no point in life,’” recalled a neighbour. On 23 December, she hanged herself. Valya will not be counted officially among the more than 5,350 people who have lost their lives in the war in east Ukraine, but is an extreme example of the huge psychological burden suffered by residents of the region. In Kiev, there is anger towards anyone who uses the term “civil war” to describe the events; instead, this is called the Russian invasion of Ukraine. While there is little doubt that the armed separatist movement could be crushed quickly if the military and financial channels from Russia dried up, as the months have gone by and the conflict has continued, the attitude inside rebel territory, where locals get most of their news from Russian television, has hardened. The process of winning back any kind of support for Kiev will be long and hard here. Most of the people who supported Kiev have left, and the divisions and separations common to civil wars have become more widespread. “Most of my family live in Ukrainian territory, in Kherson, and they don’t speak to me any more,” said Valentina. Kommunar also illustrates the way rumour and hearsay spreads to dangerous effect in wartime, reinforcing hatred and divisions. A number of people in the town mention a horrific mass grave found behind the coal mine when the Ukrainian forces left town and the miners went back to work. “The men had their ears chopped off and there was a pregnant woman who had been decapitated,” said one woman in a horrified whisper. When international monitors visited the site, they discovered “9mm Makarov pistol cartridges approximately five meters away from the bodies”, which could suggest the rumours that the people were executed were correct. The monitors only found four bodies, however. A manager at the mine, who had seen the grave, confirmed that there were four bodies. In the town, however, the figure of 80 has become a widely accepted fact, fuelling anger and suspicion further. In the fields near Kommunar, the Guardian saw what appeared to be a Smerch multiple rocket launching system, presumably brought across the border from Russia. At the two-story building where the small contingent of local rebel fighters are based, locals brought in two deaf men, whose passports indicate that they were from Nikolayev, territory under Ukrainian control. The men protested their innocence in sign language, but were detained under suspicion they may be spotters for Kiev’s artillery, after a woman read their text messages and deemed them suspicious. It was unclear what would happen to them. One rebel, a 48-year-old who worked for two decades in an asphalt factory and gave his nom-de-guerre, Greyhair, said he had joined the insurgency last June after watching Russian television claims that the Maidan revolution in Kiev was all a western plot. He insisted that there could be no way back to a united Ukraine now, partly due to fear of retributions.